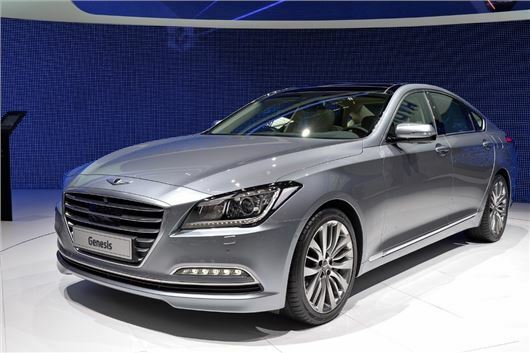 Hyundai will bring a limited run of the Genesis executive saloon to the UK for ‘selected buyers.’ The premium saloon model is a popular in the United States and Asia, but big Korean saloons don’t tend to fare well in Europe. That is why Hyundai is playing it safe with small numbers for existing Hyundai customers. Only one specification grade will be offered, powered by a 3.8-litre V6 petrol engine linked to an eight-speed automatic transmission. There’s a lot of technology on offer, including active cruise control, automatic emergency braking and a CO2 sensor in the cabin designed to alert the driver if levels get too high. The cabin is trimmed with a mixture of leather and wood, plus it features a large infotainment screen with navigation. There’s even that always-popular premium car touch of an analogue clock in the centre stack. The steering wheel is finished with a unique Genesis emblem to make it stand out from more run of the mill Hyundai models.